I've just found a rusty yoke in the shed which was with a pile of RXS100 bits, so I think that's what it's from. The stanchion spacing appears to be the same as YB100 but the diameter is bigger at 30 mm, so that looks ok for YBR stanchions. I'd like to fit this on my sons YB/Fizzy as the existing YB based forks do twist a bit if the full power of the disc brake is used. Unfortunately, whilst the (RXS?) stem is a similar overall length to YB100/fizzy, the 25 mm dia threaded bit for the stem nut (that sets the pre-load on the bearings) is a few mm lower (nearer the yoke). I tried it in a frame with the cups and cones fitted. the stem nut only goes on about one full turn, which is not really enough. I have an idea for a fix. The top and bottom cups and cones are the same except for the internal diameters, where the lower ones are bigger. 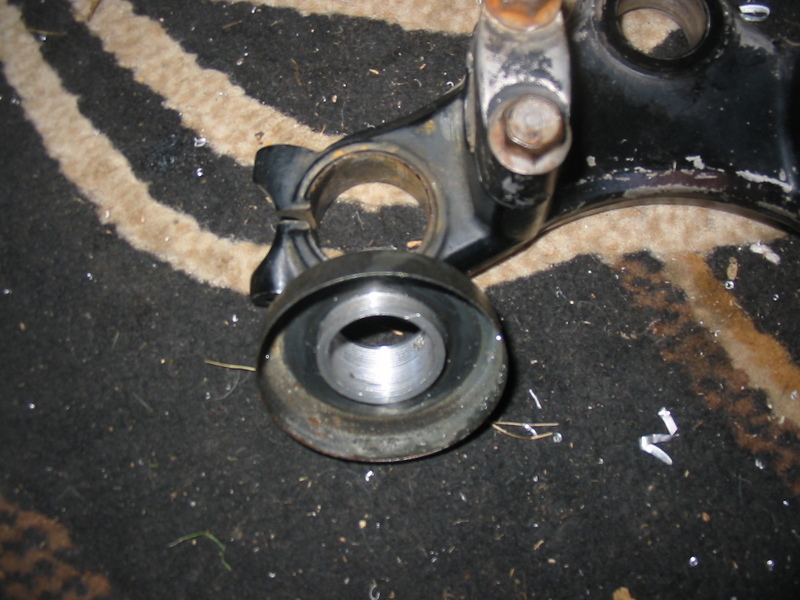 The bearing surfaces appear identical. My suggestion is to replace the 25 mm id upper cone with a lower cone, which has a bigger id of 30 mm. The thread appears to be M25 x 1.0. Taps are available but they're expensive. I've never done thread cutting on the lathe, but have all the change gears, so will have a go. Let me know if your yoke is similar. I can make 2 nuts as easily as 1. I prefer to use taper rollers and I think this fix would also work with two off '30mm x 48mm x 12mm' which is the standard replacement for the lower cup and cone set. We are running somewhat parallel on this at the moment. I received my RS100 top and bottom yokes at the weekend. As you say, the spacing is same as YB, just thicker stanchions. How this works wth the YBR wheel, I can't say yet as I don't have stanchions as yet. 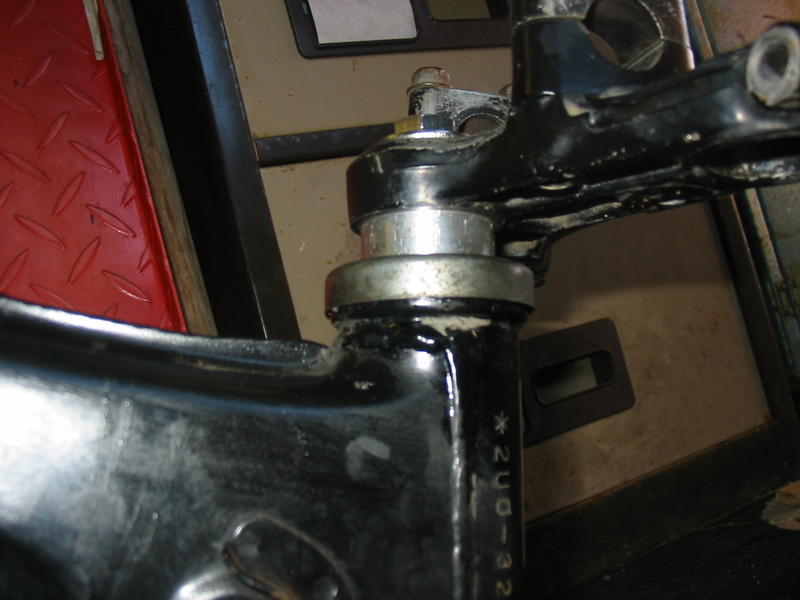 I did try the RS yoke in the YB frame. The stem seems to fit well, but I couldn't do it up as it was supplied with cone bearings on it, but no cups. Obviously the upper one slides off, but I need to take the big screwdriver/chisel to the lower to get it off, and I still have the YB cups in the head. So, I can't say whether I'm in the same spot at the moment. I have some cup bearings on the way, so I should know better when those arrive and the aforementioned tackled. 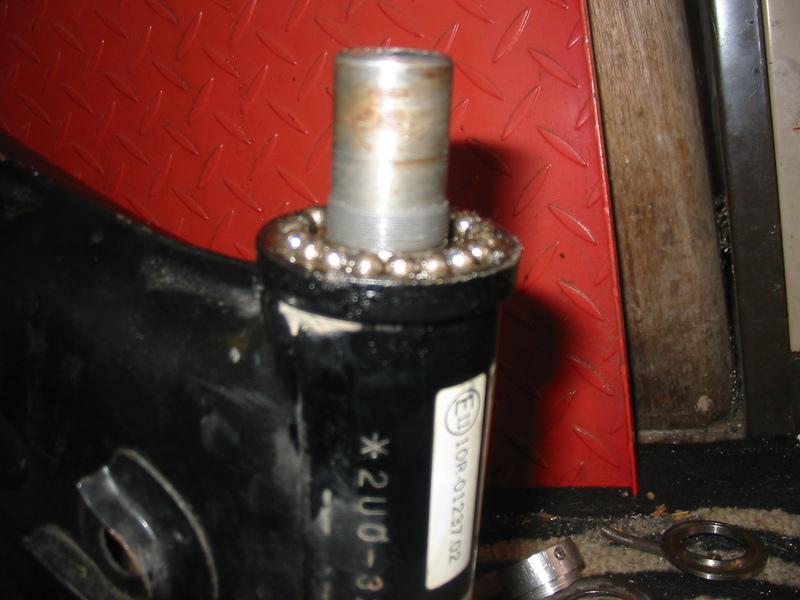 Googling parts books etc it appears that YB100/fizzy use 48mm od bearings top and bottom with 19 x 1/4" balls. Bottom bearing has an id of 30mm and top bearing is 25mm. RXS100 uses identical bottom bearing components, but the top is different. id is still 25mm but the od is 43mm and the balls are 22 x 3/16". 19 1/4" balls in each race pair. Does that make sense? I did notice an error in some YB100 parts books where they have mis-labelled some of the cups and cones. That confused me initially, but I think I've got it right now. Is your idea to replace the stock nut with the turned one completely? 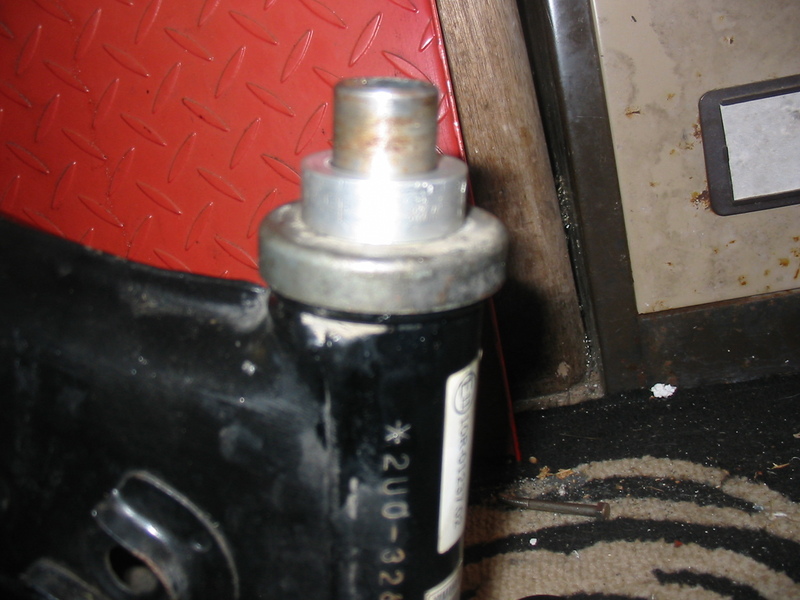 Or could you do a spacer that fits underneath the nut to transfer the pressure? Having not dry fitted mine fully yet, I've only got the jist of what you are saying till I see it for myself, and go, 'Oh!, Boll$x'! 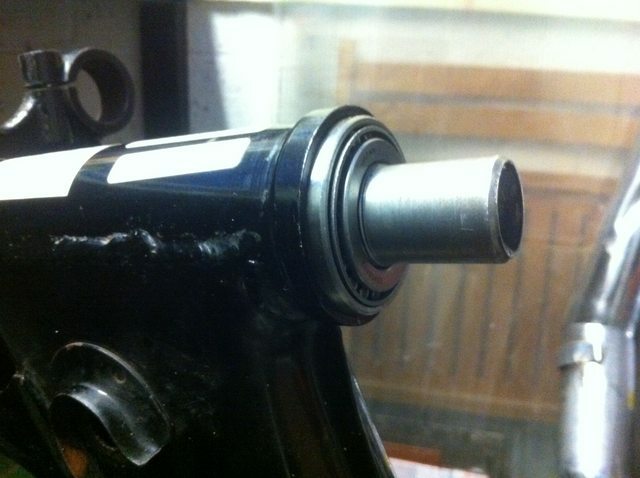 I think you will be able to use the lower taper roller bearing assembly, but will then need to get a second lower bearing assembly for the top. Simply bearings do sell one 30 x 48 x 12. Yes my intention is to replace the top nut entirely. 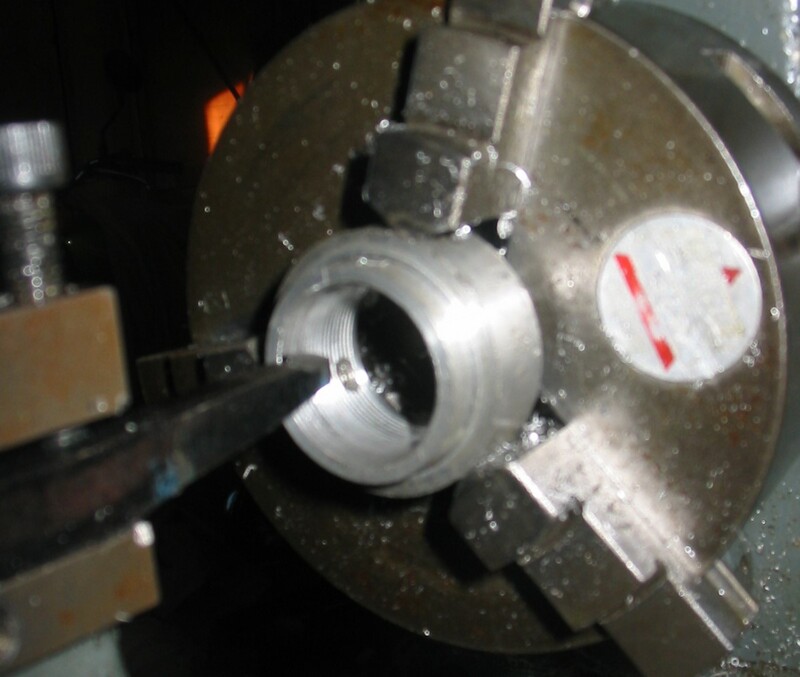 The original nut is 7mm thick, the new one will be approximately twice the thickness with half turned down to 30mm od. This will fit inside the top bearing to centre it over the thread. 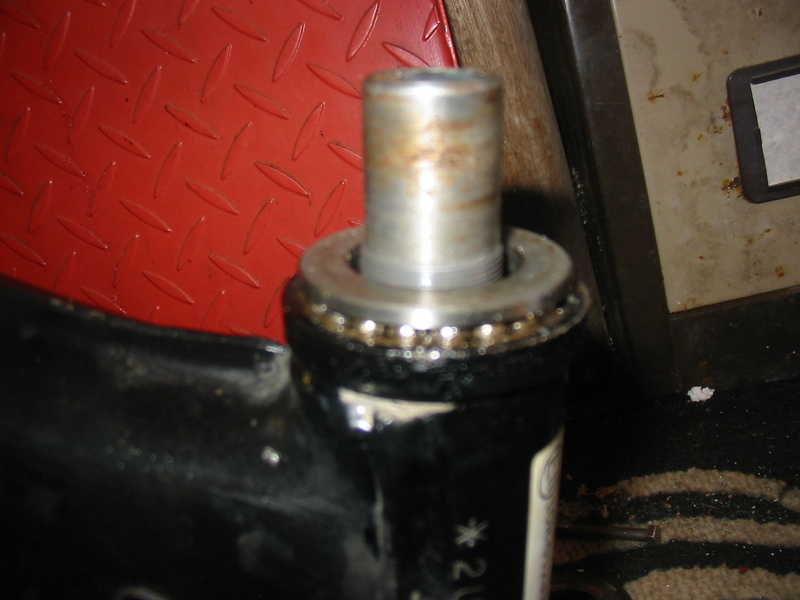 I'll thread the nut for the full depth, but the thread on the stem will mainly be insdie the bearing. 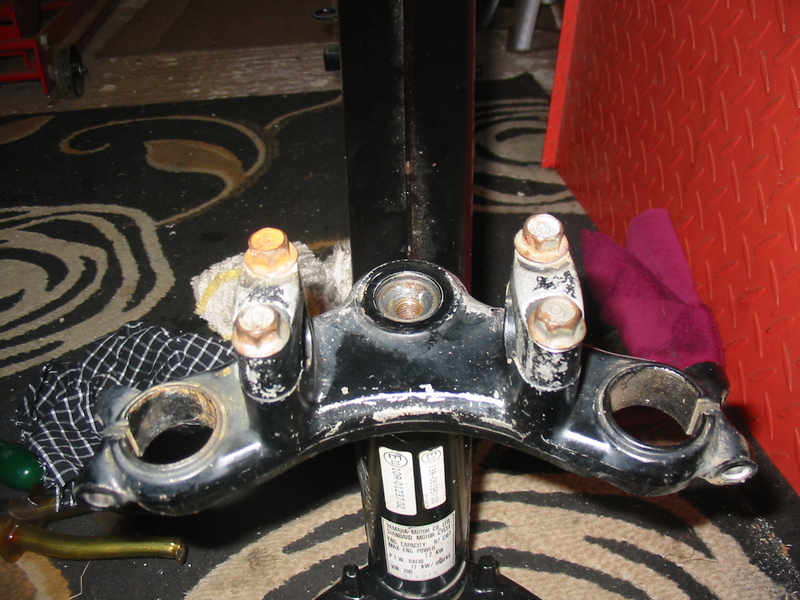 It looks like a simple spacer may also be required to go between the nut and the top yoke. If it's not too cold at the wekend I'll try to knock something up to check this all out and take some pictures. I've got lots of spare YB100/fs1e cups/cones/bearings from previous taper roller conversions. Not in the best condition for use, but ok for checking dimensions. My dry fit confirmed your findings. If you get stuck I have some RD50 front forks. Cheers mate, I think we have a plan to get the YBR ones to fit both our builds, but certainly appreciate the offer. 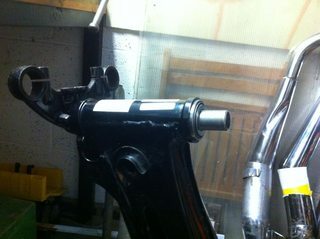 RXS100 Yoke fitted to YB100 head stock. Top bearing cone not yet fitted. Top cone now in place, but only 1 to 2 threads showing. Which isn't really enough. Bottom cone (I had a spare) is the same as the top except that the centre hole is 5mm bigger. 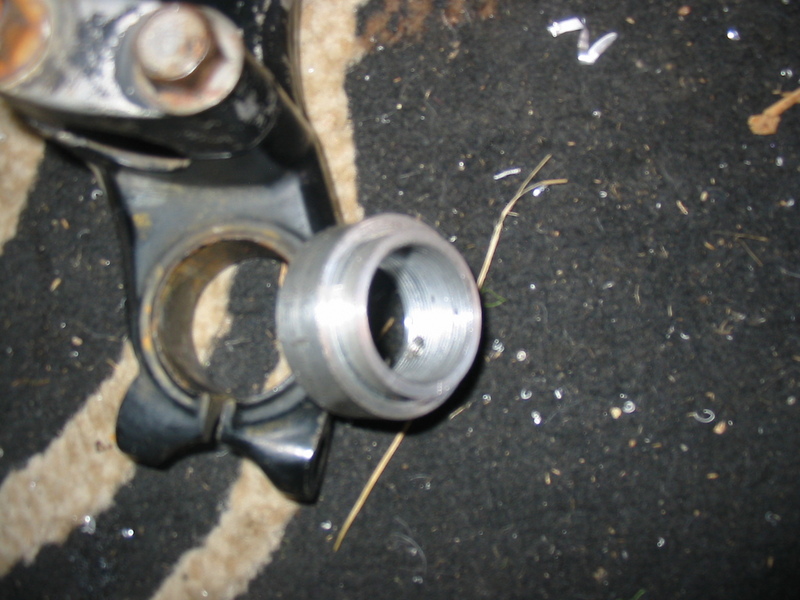 Hole in the bearing shield opened up to match the nut. Seems to fit and all feels solid. 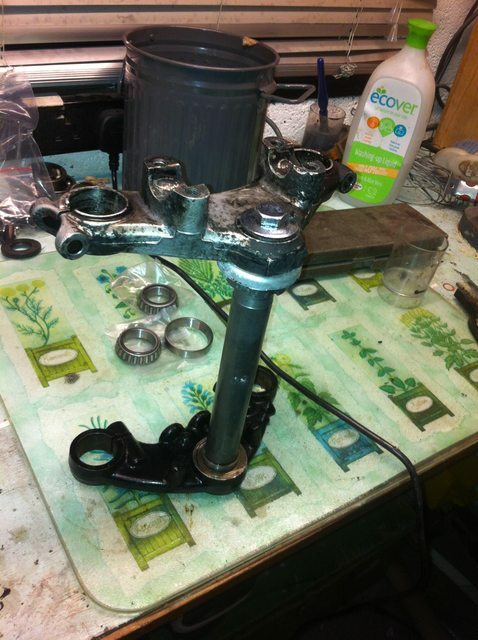 I skimmed the top of the nut until the top yoke fitted with the stem about 1-2 mm in so it was clamped by the top bolt. Just got to check all the dimensions now and make a couple of better top nuts from some 35mm hex stainless steel bar. That's going to be a bit harder to cut the thread in. I'll make the steel nut thinner than the alloy one and it can then be used with an additional alloy spacer on top. Looking good. Not sure that I'd of thought of it myself. Here's mine dry fitted. I've got different bearings to you, the original ball and cup races on it were well knotchy. 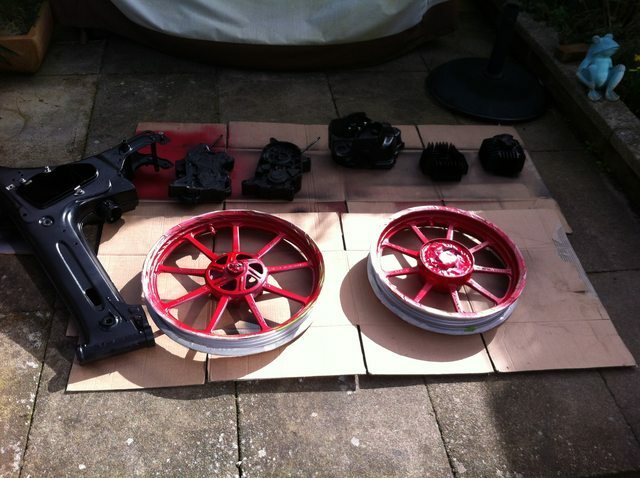 Mine is an RS100 yoke, but it looks the same as yours to my eye. Just an update to note that this is still progressing. I put the barrel, crank and cases into the local engineers. 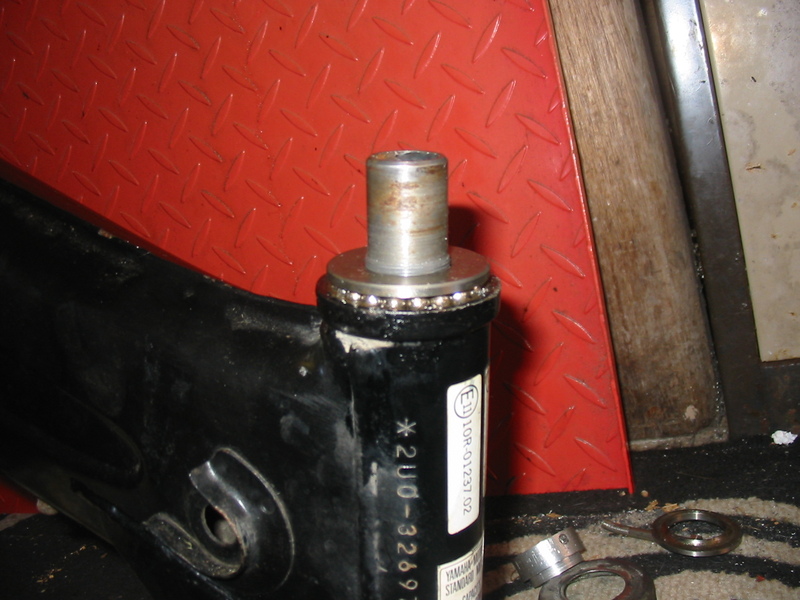 I needed the crank done, barrel bored to supplied piston, broken stud and roller bearings removed from cases. They did the barrel and cases, but couldn't get the crank apart as their plates were unable to get a purchase between the wheels. Took 3 weeks to get to that point. Was slightly disappointed because as I collected my little box of bits with the not done crank. Anyway, crank now off to a different engineers, so we'll see how they do. The little spell of fine weather in February allowed me to get on with some spraying. So now, frame is done, engine casings and YBR Custom wheels. I have bought a set of Chinese replica YBR fork legs as i couldn't find a good set of second hand ones and the price was about the same. Quality seems alright on them. I need to fully assemble the front end as yet, but it should all fit together, I do need a mudguard and the clock mounting will need sorting. The rear end will need the sprocket carrier turned down, and maybe a spacer made up too. Everything else that has come off has been painted, polished or renewed and I have seals and gaskets ready, so once it starts going back together there shouldn't be too many hold ups. I'm limited for space, so until I get the engine back together, I can't do the rolling chassis. Also been doing a few jobs on the RD, the spell of warm weather made me feel like the clock is going against me to have both ready for the season.